You've probably been hearing "eat your vegetables" all your life, but wonder if doing so is really worth your while. There's a reason vegetables have their own food group and knowing more about why veggies are good for you may motivate you to boost your intake. Getting in a variety of vegetables each day lowers your risk for being overweight or obese. One study published in 2015 in the journal Plos Medicine found higher intakes of non-starchy vegetables like cauliflower and leafy greens are associated with lower body weights. One reason is the fiber in vegetables fills you up without the extra calories. Starchy veggies however, such as corn, peas and potatoes, had the opposite effect. So if healthy weight management is your goal, try boosting your intake of fiber-rich non-starchy vegetables (greens, tomatoes, cucumbers, peppers, celery, broccoli, cauliflower, mushrooms, asparagus, and many more). What Are Good Vegetables to Plant in Late Summer? Veggies are rich in fiber (which helps lower blood cholesterol) and free from saturated fat and dietary cholesterol. Fresh veggies are low in sodium, as well (sodium can contribute to high blood pressure when consumed in excess). Therefore, boosting your veggie intake can help lower your risk for heart disease, especially if you eat vegetables in place of not-so-healthy foods. The World Health Organization confirms boosting veggie intake helps lower cholesterol, blood pressure, and your risk for heart disease and stroke. A 2014 review published in BMJ Open found higher intakes of fruits or vegetables (especially leafy green veggies) significantly lower your risk for developing type 2 diabetes. Why is this the case? Consuming plenty of non-starchy veggies helps prevent overweight and obesity, which are type 2 diabetes risk factors. Likewise, non-starchy veggies contribute to a less dramatic blood sugar spike than starchy veggies (corn, peas, and potatoes), as starches are much higher in carbs. So focus on non-starchy vegetables for diabetes prevention. Because veggies are loaded with fiber and antioxidants, eating lots of them can lower cancer risks. A 2015 review published in The British Journal of Nutrition found higher veggie intakes lower your risk for many common types of cancers, especially cancers of the digestive tract. This finding provides yet another reason eating vegetables is so good for you. Believe it or not, eating vegetables may improve your mental health and even make you happier. One 2017 study published in BMC Psychiatry found eating fewer than five servings of fruits and veggies daily boosts the odds of depression. Another 2016 study published in the American Journal of Public Health says higher fruit and veggie intakes are associated with increased happiness, well-being, and satisfaction with life. Vegetables may also help keep your brain sharp longer according to a 2017 study published in Frontiers and Aging Neuroscience. Researchers who conducted the study say boosting fruit and veggie intake lowers your risk for cognitive decline and dementia. One reason vegetables are so beneficial for your health is because they're loaded with fiber, vitamins, and minerals, and non-starchy veggies are low in calories (but still help fill you up). Many veggies are rich in antioxidants like vitamin C, beta carotene, lycopene, and lutein, which appear to help protect against a whole host of health problems (dementia, cancer and many others). Replacing junk food, especially added sugar, with nutrient-rich veggies should help your energy levels skyrocket. How Many Veggies Should I Eat Daily? The general rule of thumb is to aim for at least 5 servings of fruits and veggies each day. 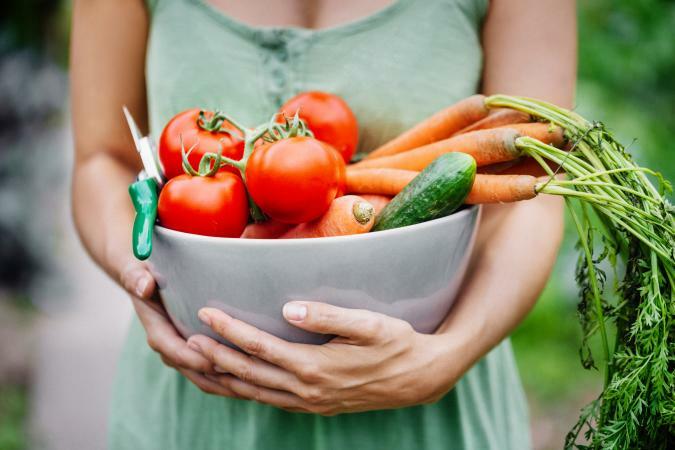 The Dietary Guidelines for Americans 2020 suggests if you're eating 2,000 calories a day, aim for a minimum of 2 1/2 cups of veggies and 2 cups of fruits and if you eat 2,400 calories daily, aim for 3 cups of veggies and 2 cups of fruit.